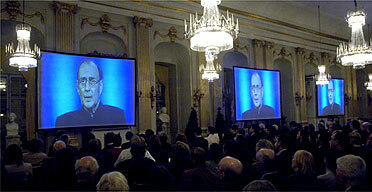 Nobel address by video from London, December 2005. Playwright Harold Pinter's Nobel Prize acceptance speech of 2005 (newly edited by KD) is a stunning indictment of U.S. wars and imperialism since 1945. Pinter contrasts dramatic art--where "truth" is elusive, perhaps unknowable--with public life. Here truth can be known. But citizens don't know the truth because the government is lying and deceiving nonstop to cover up its imperialist plundering and its vicious wars of aggression. The heart of the speech is a stunning denunciation--and survey--of U.S. military aggression abroad since 1945. Pinter pays particular attention to the then-current war against Iraq and the proxy wars of the recent past (notably against the Sandinista government of Nicaragua, under Reagan). Ten years on, this remains a powerful and moving indictment of U.S. foreign policy--and of the foreign policy of the U.S.'s "lapdog," Pinter's own country, the United Kingdom. With an introduction by KD and (in Part 2) a relevant song by Ethan Miller & Kate Boverman. 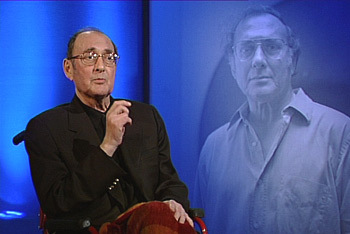 2015 marks the 10th anniversary of Pinter's Nobel speech and the 85th anniversary of his birth (in October 10, 1930, in Hackney, London, UK). He died in 2008. Thanks to the Nobel Prize Committee for the video of Pinter's address. I have cut approximately six minutes from near the beginning of the speech (a close analysis of parts of certain Pinter plays) and shortened several long pauses. The speech is otherwise complete.